Time is moving too quickly. Stores are already decorating for Christmas, our local station 96.9 is already playing Christmas music non stop. Well, I'm not ready to burst into the next season without fully decorating for this one. Each season has its own special colors to create displays. 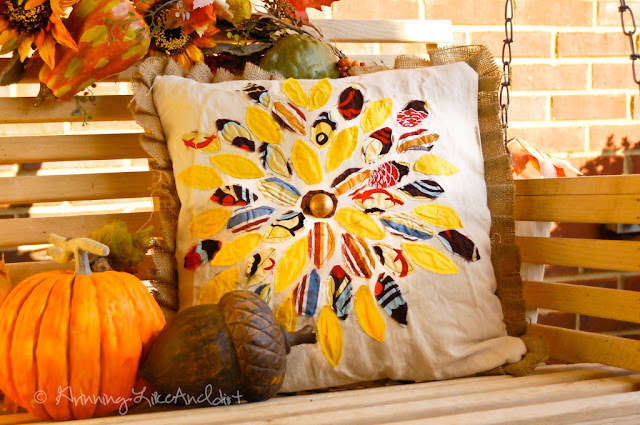 For Fall, I love the splashes of orange, red and yellow that are accented with browns; with some scrap material, canvas material, burlap material, patience and a snazzy button I whipped up this cute Fall pillow to grace our front porch swing. Take a moment, give thanks for everything you have been blessed with, my hope is you have a Happy, Safe, Warm Thanksgiving and may God bless your families.